The transfer window opens tomorrow and Lee Clark says he’ll be banging on Blackpool chairman Karl Oyston’s door. Having made nine short-term signings last month, the Pool manager now wants to lay stronger foundations for the club. And he’ll start by persuading Pool’s under-fire chairman to part with some cash following a dreadful first half to the season which has left the club adrift at the bottom of the Championship. Eight players will be out of contract by January 21, and Jacob Murphy’s loan expires at the start of February. It leaves Pool facing the challenge of rebuilding their squad for the third time in six months and Clark said: “I’ll be banging on the chairman’s door in January as we need reinforcements big style. “There isn’t an open chequebook here but I have to sit down with the chairman and tell him what I think we need at this club. “I’ll tell him what the cost of it all will be because that will be the big thing. Donervon Daniels, Stuart O’Keefe and Kevin Foley’s loans have already expired, while Jamie O’Hara and Darren O’Dea’s deals end after Sunday’s FA Cup tie at Aston Villa. Tom Kennedy is due to return to Rochdale on January 14, while Chris Eagles’ contract runs out on the 18th and Nyron Nosworthy’s on the 21st. Pool are in talks with several of these over long-term deals, with Eagles and O’Hara high on Clark’s wanted list. The manager added: “We are still in talks and decisions have to be made soon. 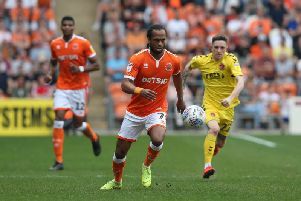 There could be new faces running out in tangerine that day and Clark said: “The FA Cup gives me time to try to get the targets we’ve identified in the building before we face Millwall. Clark doesn’t agree that Pool’s league position will be a stumbling block when it comes to attracting players. He hopes they will view a move to Pool as a challenge. He added: “When I’ve spoken to potential targets and agents, our league position has never come into it so far. “We are offering players the chance to play Championship football and maybe be involved in what would be an unbelievable achievement if we can stay up.